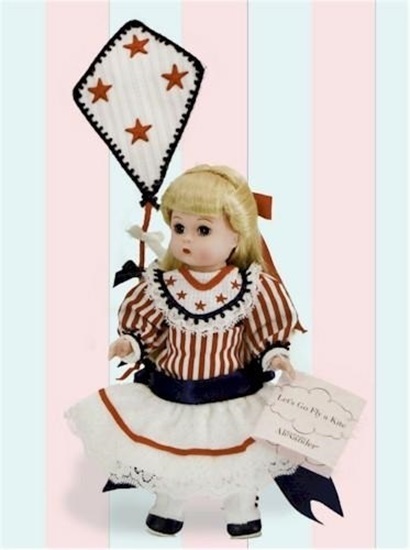 From the Americana line of dolls comes "Let's Go Fly A Kite", this is an 8-inch fully articulated Wendy doll . She has blue eyes that open and close with hand painted eyebrows. Her long blonde hair is pulled back in a half pony tail behind her head and tied with a red ribbon. She looks very patriotic in her red, white and blue festive dress. She is wearing a red and white striped dress with a satiny blue ribbon tied around the waist and a bow in the back. The skirt of the dress is white, with red striping at the bottom and lace throughout the skirt. White bloomers, and blue and white boots complete this fun and festive ensemble. She comes with a wire mounted kite that will surely take her to the highest height!